The Human Resources Recruiter is responsible for delivering all directives of recruiting success throughout the organization. The recruiter will achieved this through the development of local and national recruiting plans, implementing traditional recruiting strategies and resources and also developing new, creative recruiting ideas. The Human Resources Recruiter will play a key role in ensuring that the company is hiring the best possible talent. You will organize and develop and execute efficient recruiting plans. You will maintain contacts with other recruiters, conversing with association memberships, trade groups and employees within the company. Coordinate and administer college recruiting initiatives and objectives. Take care of administrative duties and recordkeeping. Work close with hiring managers and plan recruiting meetings. Lead the creation of a recruiting plan for all open positions. Efficiently fill open positions with qualified personnel. Hold regular follow-up meetings with managers to determine what the effectiveness of the recruiting plans and the results of the implementation are. Develop a pool of all qualified candidates for a position well in advance of the need. Post openings and job descriptions in newspaper advertisements. The way you can get into this great position, is to have two years of general business experience, Human Resources experience as a hr recruiter. This is a fantastic field to get started in on the ground floor and then once you are in, the possibilities are endless. Most companies will want a BS degree in business administration. 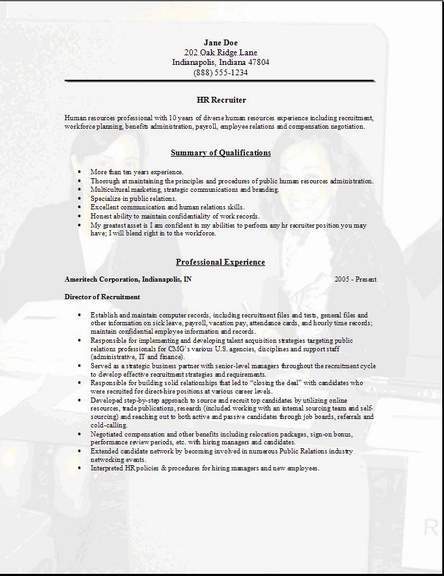 The hr recruiter resume template above was a very recent addition. 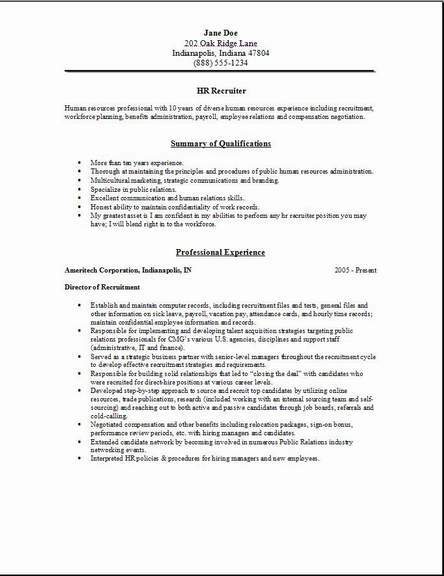 Download 3 of the most useful resume formats and then edit the examples with MS Word. Some people love Chronological, I know I also prefer that format. If you decide on downloading one of the free resume templates we offer here, then drop me a comment back on the contact us page to let me know how to improve it even more. I would love to here from you whether our examples helped you out or not. They are a word document held in a zip file so be patient when opening them. 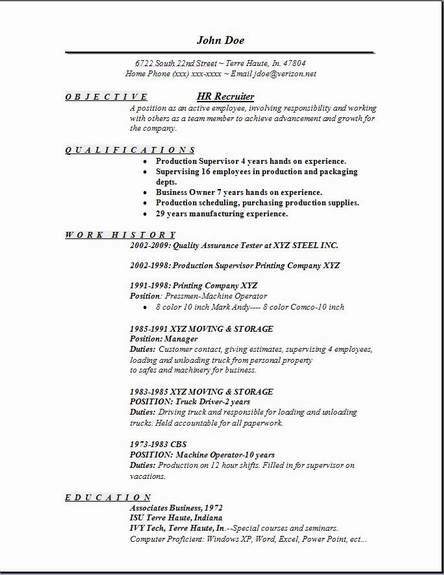 Check out some of the inside pages for more great details on creating your resume. Back to Free Resume Templates Home Page.